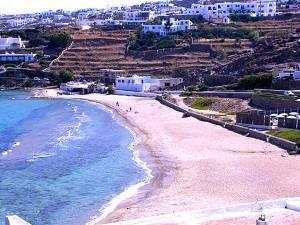 This is the nearest beach to Mykonos Town, just a ten-minute walk south and along the west coast on the way to Ornos. Accommodation at this location combines good beach access with all of the attractions of the town. This beach offers rich sand and magificent views to Agios Ioannis promontory across Korfos Bay and, beyond this, of the islands of Delos and Tinos. On a clear day, the island of Syros is also distinguishable. It's a fine beach when the wind comes from the South. During the "Meltemi" (North wind) days, nevertheless, one should move to one of the many beaches open to South. This was the first beach in Greece where mixed bathing (swimming for both sexes) was permitted.